...that the Drifter maintains a working relationship with Shin Malphur? "Until the Darkness reigns, the Eyes must never close." 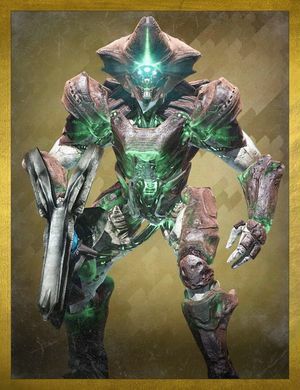 Sardok, Eye of Oryx is a giant Hive Knight who protects the Shrine of Oryx. As soon as the Guardian breaches the shrine, Sardok is immediately called upon to protect it and draw the Guardian out, but Sardok is eventually defeated, and the shrine is destroyed. Sardok is fully immune to all damage until the doors behind him are fully closed. Unlike his relative brood, Sardok's skin color is turquoise. In addition to this, Sardok is also the first Hive ultra to be in the Blood of Oryx. Sardok is the only Hive boss who belonged to the Blood of Oryx faction prior to the release of The Taken King. Sardok is also one of the only Hive to be named in honor of Oryx while not being Taken.